I haven’t reviewed anything in some time, eh? Letters from Iwo Jima is rather like the companion piece to Clint Eastwood’s other movie, Flags of Our Fathers. Both movies deal with the World War II battle at Iwo Jima (the name translates to “Sulphur Island”); Flags is a take from the American side, and Letters is from the Japanese side. I haven’t watched Flags yet – but I will in a couple of days, or next weekend, hopefully – so I’ll write about Letters first. I’m normally not a war movie type of person, but the big names attached to the show as well as its Oscar nomination for Best Picture – made me curious. And I figured it should be interesting, having two movies telling the stories of two sides of the same battle. 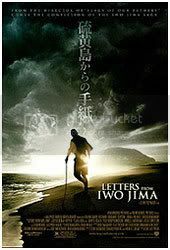 Short summary: Letters revolves around the Japanese troops based in Iwo Jima, and their struggle to defend the island from US invasion. In particular, it focusses on the commanding officer, General Kuribayashi (Watanabe Ken), and a soldier called Saigo (Ninomiya Kazunari). Kuribayashi, who spent time in the US, has a somewhat more humane approach to his leadership, which irks some of the other commanders under him. Saigo, a baker who was forced to join the military, is plain sick of the war and all he wants to do is go home to his family. I think overall it’s a good movie (and quite the type they tend to nominate for Oscars) although I wouldn’t watch the whole thing again anytime soon (all the blood and gore doesn’t suit me). I liked how both sides were portrayed with good and bad characters. It wasn’t an “Americans=good, Japanese=bad” thing; both had “nice guys” and both had “bad guys.” Having parts of it ‘narrated’ through the characters writing letters home was a good way to add a more human touch to the brutality of war. There was one scene that really stood out in my mind – it almost made me cry. It was when Baron Nishi (Ihara Tsuyoshi) found a letter on an American P.O.W. who had just died. He had sometime earlier ordered his men to treat the American soldier’s wounds, and had struck up a sort of friendship with the man. (Nishi knew some English, being an Olympic equestrian rider – and he’d been to the US before.) The letter was from the man’s mother – full of descriptions of their home, and words of reassurance, ending with a hope that the war would end soon. Nishi read the letter aloud to his men, translating as he went along, and you could almost feel their perceptions of the enemy change a little. Most of them had never met the other side, and always thought that they were savages and brutes (I daresay the same went for the Americans), but this one man’s letter from his mother just hit home, being something that their own mothers or wives might say to them. The washed-out colours of the whole movie fit the mood and era, even if it’s not exactly my favourite type of colour palette. But it definitely helped bring out the grittiness of war and added to the feeling of a historical event. I just wonder… How did Mr Eastwood manage to so successfully direct a movie that’s almost entirely in Japanese? Kudos to the scriptwriter and translators. Must’ve been a lot of work on their part. i find it weird how Ninomiya managed to transition from a serious Hollyowood epic like Iwo Jima to some silly Jap comedy drama like Yamada Tarou.